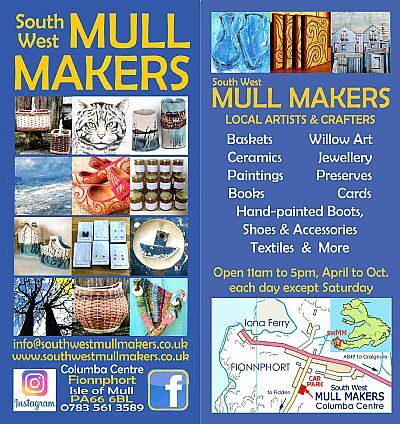 In 2019 I will be selling my artwork, books, cards and postcards in our South West Mull Makers shop/gallery which is located in the Columba Centre next to the free car park in Fionnphort (the ferry port to Iona at the south west tip of the Isle of Mull) and is open 6 days a week (not Saturday) 11 to 5 until the end of October. 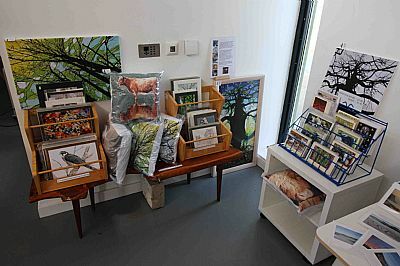 We are a group of 10 makers/artists who display our beautiful range of work in this delightful setting. 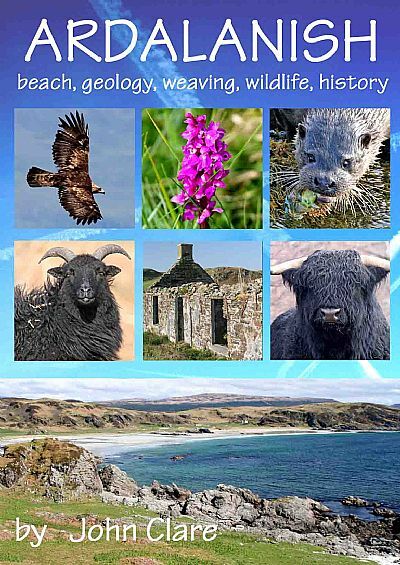 Guide to the landscape, wildlife and history of Ardalanish - the spectacular area south of Bunessan noted for its glorious beach and geology. 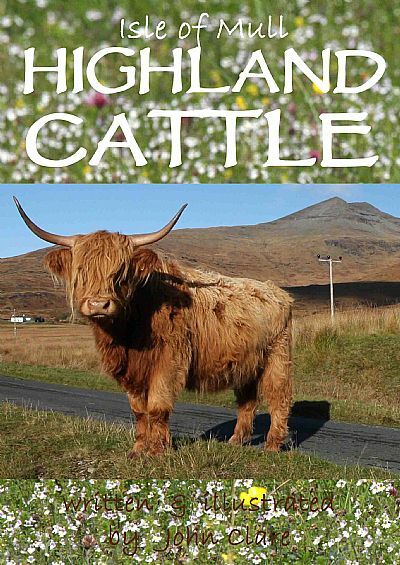 It includes information on the Mull Weavers visitor centre and Ardalanish Farm shop and trail. 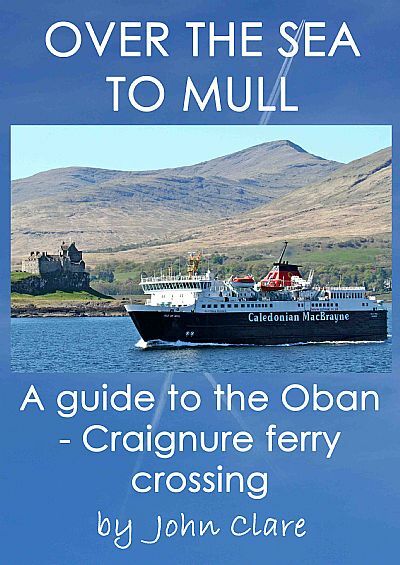 A guide to the spectacular ferry crossing between Oban on the Scottish mainland to Craignure on the Isle of Mull with details of the wildlife, landscape and history. Highland cattle are an iconic breed that is not only photogenic, but very important in maintaining the biodiversity of the Isle of Mull countryside. All of the booklets, photographs and artwork on this site have been produced by me and are copyright. Paper or digital copies can be obtained by contacting me by e-mail. Private viewing by appointment. 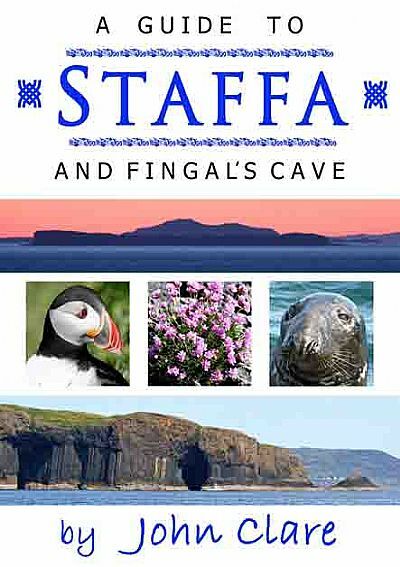 My guide to Staffa (one for the Treshnish Isles boat trip also available). 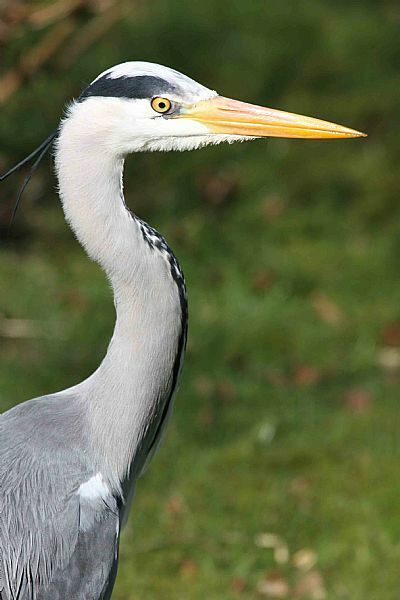 One of two grey herons that are visiting the wildlife garden every day to hunt for frogs in the pond and field voles amongst the grassland and heather. The garden has a range of much richer habitats that the surrounding fields (over-grazed), but why they aren't down at the bay fishing I don't know (too many other herons perhaps?). They also roost in the large spruce trees in the garden so perhaps they are going to nest? Some of the 16-18 goldfinch charm that visit the feeders each day in winter. While carrying out the BGBW yesterday morning (29th Jan) we spotted a large group of corvids (ravens and hooded crows) wheeling over the high moorland behind the house. Suddenly, a pair of white-tailed eagles appeared above the horizon, the size difference between the female and male being very apparent. They soared for a while, carried out a couple of pair-bonding manoeuvres – with the male flipping over in flight below the female – and then swooped down on the moorland out of sight. Within a few moments, another eagle appeared flying directly towards us. It soon became apparent by the shape and the white under-wing patches and white on the tail, that it was a sub-adult golden eagle. With all the corvid and bird of prey activity where it had come from, it seemed that it had been disturbed from a carcase by the arrival of the pair of sea eagles. 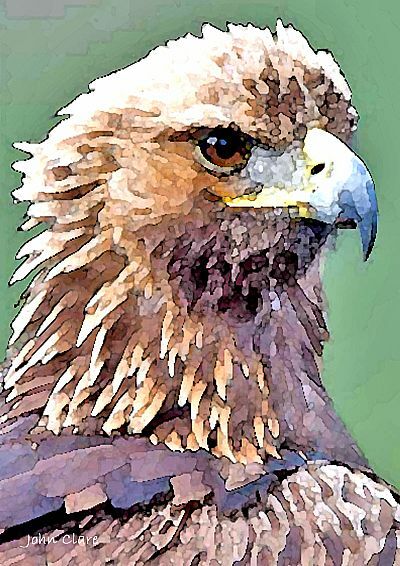 The young golden eagle flew low over the moorland, descending toward a rocky outcrop on the slopes above our back garden. It landed on one of the promontories where it proceeded to survey its domain and carry out a desultory preening routine where the full extent of the white tail plumage became very apparent. This gave us enough time to fetch and erect a telescope and spend a superb 15 minutes watching this marvellous bird, it’s golden head catching the sun that, each day, is gradually rising above the southern moorland as Spring approaches. A hooded crow brought an end to the proceedings when it started to mob the golden eagle where it sat, causing the bird to fly off, rising with heavy wing-beats, turning several times, until it disappeared over the hill top. Meanwhile, looking back east to where the golden eagle had come from, the white-tailed eagle pair were again up in the sky, the female being mobbed relentlessly. She moved easily away without a single wing-flap, flipping over every so often as one of the crows swooped down from above. Both sea eagles rose inexorably until almost out of sight, heading off into the distance. What a BGBW 2018! Also during the hour 5 greylag geese and 1 raven flew over. Working as Forest Officer for Tiroran Community Forest on the Isle of Mull for South West Mull & Iona Development. 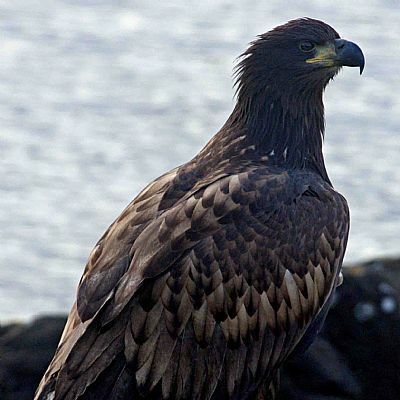 Working for RSPB leading the Mull Eagle Watch trips and other events. The juvenile white-tailed eagle from Tiroran Forest in 2015. 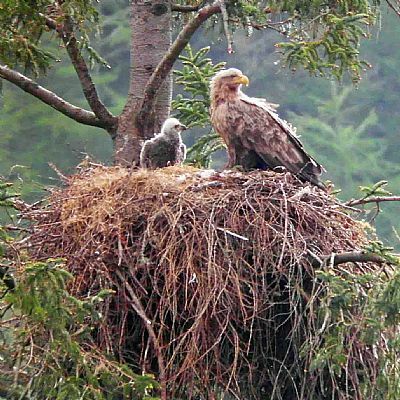 The nesting white-tailed eagles at Tiroran Community Forest in Glen Seilisdeir. Carring out a biodiversity audit of the Isle of Mull and Iona. Logo I designed for the Mull Biodiversity Audit I carried out for RSPB showing the rare slender scotch burnet. 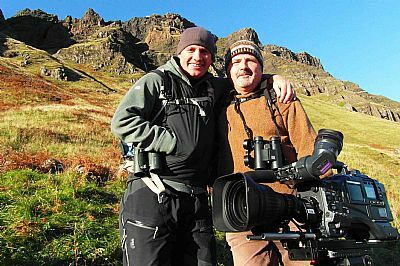 Helping the BBC Autumnwatch/Springwatch and The One Show team film the wild goats at Carsaig on Mull and appearing on the programme. Mike Dilger, the One Show presenter with yours truly. 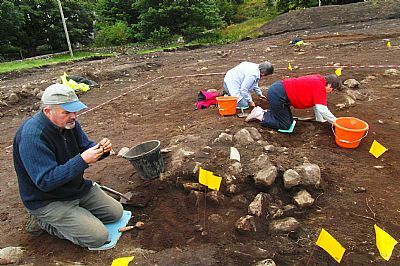 Working for the Ross of Mull Historical Centre carring out landscape archaeology surveys and a range of other projects. Helping with an excavation on Iona. Writing and illustrating a range of books about the Isle of Mull and its wildlife - see BOOKS page.